The North Fork vineyards are VERY kid-friendly. I bring my three kids, including my baby. You can have a great time. Your kids can have a great time. Here's the essential guide to the best family day out east on Long Island. Get there early to beat the traffic. On the weekends, the North Fork gets packed and there are only two main roads. Most vineyards open at 11am. That's a bit early to start tasting so we stretch the kids' legs at Reichert Family Community Playground in Peconic. The playground is cute and does the trick. About a three minute drive from the playground is Bedell Cellars. This is the best Long Island wine. They have a great outside area where you can sit in shaded picnic tables or on the back porch. Anything outside on the grass is empty so it's perfect for the family. We often bring washable markers and new coloring books and the kids will occupy themselves while we try a flight of their reds. The view of the grape lanes and landscaping is beautiful soothing. Sometimes we bring our dog. It's feels classy, stylish, and adult while still friendly to children. Note: When they have events they won't allow arrivals after 1pm. This is another good reason for putting this vineyard first on your list. The kids have been good but you can tell they need to run off some energy before sitting good for lunch. Next, drive 15 minutes to Greenport's Kontokosta Winery. The wine is great, the tasting room is gorgeous, but the best part is the wide open field and views of the Long Island Sound. You will feel relaxed as you sit out on a red chair under a tree close to the house or take a walk out to the water. Bring a soccer ball and football and the kids can run and explore as much as they want. The area is so large and the winery lesser known so the place always feels empty. Our favorite place to eat is at Crabby Jerry's in downtown Greenport. The menu is typical dockside seafood but the food is fresh and delicious with a standard kids menu. The line can be long but moves quickly and the open air seating is sympathetic to slightly loud kids. I always get the New England Clam Chowder and Greek salad. My husband buys chocolate chip cookies for the kids for good behavior later. Relax, take in the views of the bay and yachts, and enjoy! It make look like a dive but the food quality is great. Note: It is on a dock so you have we strap our toddler into the highchair and hold him as we come in and out. Also, there is plenty of parking in front of the restaurant. The deal is that you pay $20 to enter the parking lot and get it back as long as you eat there. Finish off at another family-friendly vineyard. Start heading home with a stop or two in Jamesport. Jamesport Vineyard has a large open back space with many different and isolated seating areas. The wine is pretty good but they only allow flights inside. Buy the whole bottle (it's more cost effective) and if you don't finish it, they will seal the bottle to take home. We let our boys roam the whole lawn or set them up again with markers at the table. It's large enough where the kids can be a little wild and it doesn't matter. This is where cookies are given for good behavior. Before you start the ride home, thoroughly tire the kids out with one last reward to close by playground. This will ensure a quiet back seat for the whole journey. 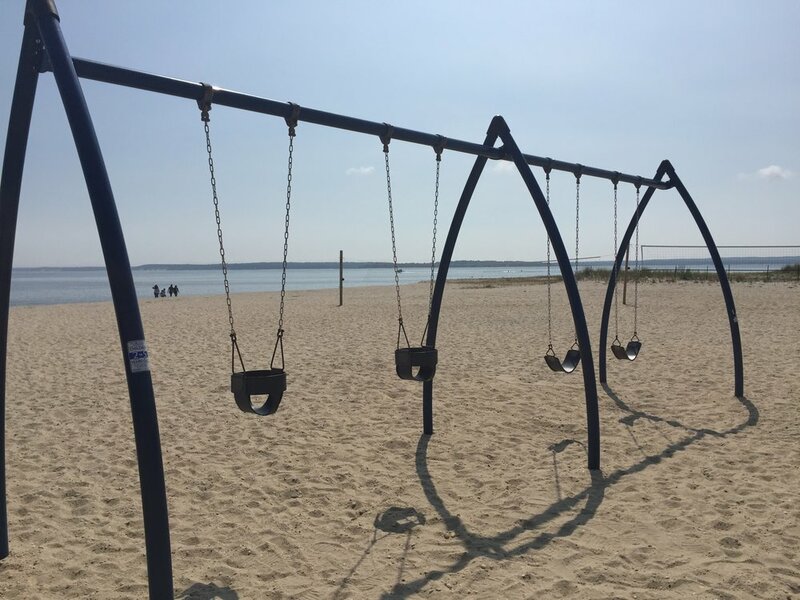 South Jamesport Beach Playground is gorgeous and in the off season is free to enter. 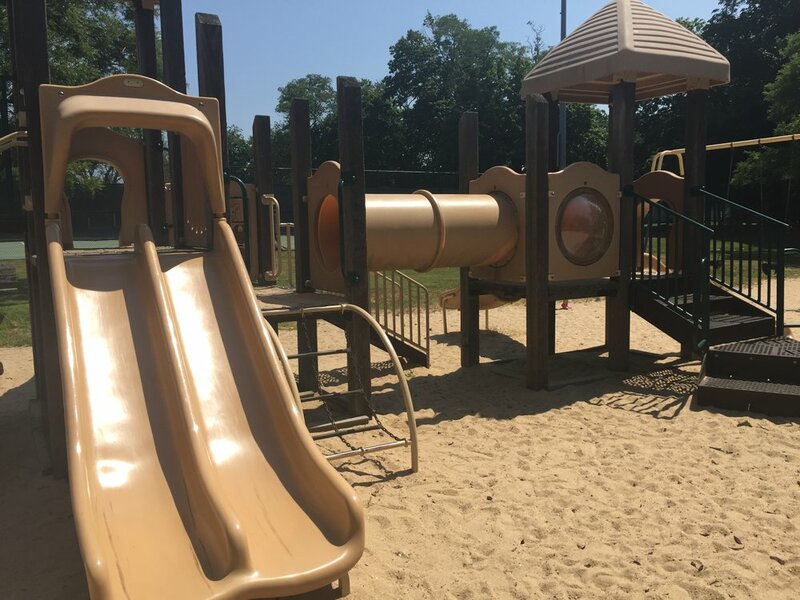 Take in the views while the kids have fun on the new equipment.